Your first Computer. Where did you start? Topic: Your first Computer. Where did you start? Just thought it could be interesting to see where you all started..
My first computer ever was WAY back in the 80's.. It had a processor running at a whooping 3MHz, and 16K or RAM!! Had to plug it into a TV. But it did it's job, and I learnt to program my first lines of BASIC on it..
Had a few cool (back then) games for it as well.. It's still stashed somewhere down in my basement, and I believe it's still working fine.. I just need to find a new casette player for it. Mmm, getting all warm inside when I see the startup screen below..
Found a pretty cool TI-99 site, and it even has a few emulators for Windows. that was I think more than ten years ago. Never was into computers and such. Remember the comandore 64 though with tape storage being quite fun to play with. My first computer was cutting edge Commodore 64 mich like this one, circa 1982. My dad had a Tandy-1000 when I was little. My first computer was back in 1998 or 1999.... I got a Pentium III 500mhz and top of the line was 550mhz. I had the Sound Blaster Live Value (Top-of-the line) with a 15GB HD. It's amazing because a computer like that now is just pathetic. Now, I have a Pentium IV 1.9Ghz, but after I deploy, I will be building the best computer possible, and will be willing to spend up to $5,000.00. It will be custom built as well. That's incredible fast compared to the first real PC I owned.. I believe it had an 4.77Mhz Intel 8088 processor, 364kbytes of RAM (expanded! ), 5,25" 360kbyte floppy disk (yes the big ones), and a green monochrome screen, only capable of displaying characters (no graphics at all)..
Hmmm well I dont remember a lot of the specifics but it was a Sinclair/Timex 1000 with a massive 16k (upgraded came with 1k) of memory. Man I miss the days you could get fun quality software on a casette or 360kb disk now you get poorly written crap on 3 DvD's. The old mac classic I first got in about 1992 I think it was. As for a consol gaming thingy. I got an Atari 2600 when I was a youngster. 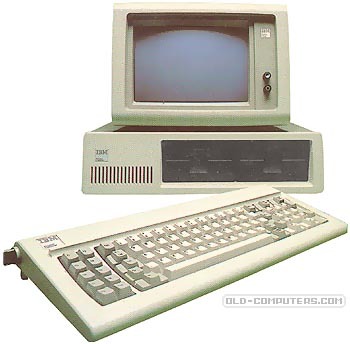 Although I'm not familiar with the old computer models, I remember it was among the first IBM Personal Computers.